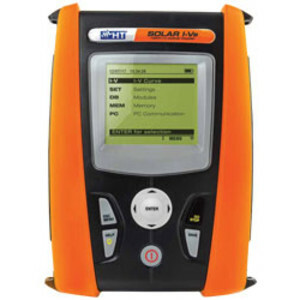 The HT I-Ve Solar Tester is designed to measure the efficiency of single-phase photovoltaic systems and verify the I-V curve of a module or a string. It is available to rent from TechRentals. 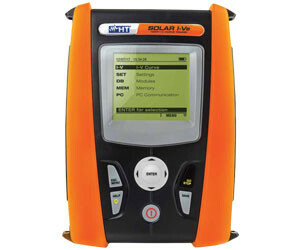 For measuring I-V curve, the Solar Tester manages an internal database of modules (which can be updated at any time by the user) to compare the measured data with the rated values, thus allowing the immediate evaluation whether the string or the module fulfils the efficiency parameters declared by the manufacturer. Measurement of short-circuit current Voc/Isc and open-circuit voltage can be performed with ease using the HT Solar Tester. Data from the instrument can be downloaded onto a smartphone or tablet via Wi-Fi for easy viewing of results. The HT Solar Tester also features the HTCloud database, which allows the user to share results and measurements with colleagues. Additional features include an online FAQ and troubleshooting assistant, power measurement of modules and strings, and a large LCD 128 x 128 backlit display for easy operation in bright conditions. I am interested in HT I-Ve Solar Tester .